Those who want to develop as coxes may like to follow a British Rowing Course. For others please look at the following for guidance when coxing club gigs. Safety must be your first priority. If you believe a certain course of action is unsafe then, even if your coach or crew has asked you to take it, you must not. You should not feel pressured by either your crew or your coach into doing something you believe compromises safety. If you find yourself approaching boats moving slower than you then you must take action. However, if you are in any doubt at all as to whether this is safe then you must slow down and stop. If you do decide to stop you must make sure that you are aware of boats behind you. The most obvious safety concern is the weather. Strong winds, confused or heavy seas, a very fast stream or low visibility all make life much harder. If, in light of the conditions, you do not feel that you can maintain complete control then you must not go out. Spot floating obstructions and tethered buoys which can sometimes be partially sunken. Before you reach them take evasive action - they can cause a lot of damage. Try to avoid the blades crashing into objects, the bank or another boat. Blade clashes are a fact of life but it is not a pleasant experience to have your blade meet something solid with no warning. Simply call "bowside (or strokeside) blades in" if necessary. If you think there is a safety hazard of any nature then you must act. Simply "hoping it will be OK" is inadequate. A successful relationship between cox and rowers must be built on trust and this has to be earned. Warning the crew is very important in cultivating a relationship of trust so that they can do their job without any concerns (including the next topic). It is important to note that the rudder will not start to act the instant you move the lines - it takes a couple of strokes to work. This delay time is dependent on the speed at which you are moving as well as the behaviour of the gig. If the boat is moving slowly you will find that steering with the rudder has very little effect. Therefore if you are moving very slowly (or are stationary) you will have to steer using the crew. Oversteering causes excessive drag can nearly stop a boat and cause loss of steerage anyway. Once moving there are two ways to change course. One option is to use the rudder. The other option is to get one side of the boat to pull harder. Most of the time the former will be the more appropriate. When going round sharp corners particularly during a race you might want to get one side to pull harder as well as using the rudder. The crew need to know well in advance what your plan is. In an emergency it does not matter how you steer. Use both the crew and the rudder to ensure that danger is averted. If the steering suddenly stops responding then it is possible that you might have caught something on the rudder. Finally, you need to steer with the least effect on balance and speed. In general sit in the middle of the boat and do not move around or forwards and backwards. However you may use your weight, left or right, to balance the crew and you may move to the inside rounding a mark. Practice this with the strokeside rowers being aware of your actions to see if it helps them with their blade presentation. These are of different nature – before you start rowing, during rowing and stopping and manoeuvring the boat. 1. To whom are you giving the instruction? o “Full crew, Bowside, Strokeside, Bow four, stern pair, 2 etc”. 2. Where in the stroke do they start? 3. Any other information required. This can often be omitted. 4. "Ready?" You may need to pause in case someone is not ready. 1. State your commands. If the command is a long one do not be afraid to say it over the course of two strokes. Keep it clear precise and repeat if necessary. Crew faces will tell you if they have misheard or are confused. 2. Warn the crew when you want the command acted upon. Once the command has been given you can warn the crew either by saying "Next stroke" "at the catch” or count down until the change such as “in (3) – 2 – 1 – Go”. 3. It is very important to understand the crucial role of right timing of calls early on. Calls used when not all rowers are rowing. You should refer your commands to – strokeside or bowside – stern pair or bow pair. For individuals, use seat numbers or names whichever you believe to be the most effective. "Wind it up to 28" or "wind it up to race rating" is used to increase the rating, usually these are followed with a number of strokes over which you want the rate shift to happen “wind to 28 over 5”. Or “wind up to 28 in 5,4,3,2,1”. Use the same language with the crews each time. Use a club wide language. "Wind it down" is used to decrease the rate to a comfortable level (the precise rating is chosen by Stroke). "Up 2" and "Down 2" are used to change the rate precisely. When calling for changes in the rating or the pressure you should explain to the crew HOW as well as WHEN you wish them to make the change (e.g. "rate up with pressure on the legs", or "rating up 2 by speeding up the hands" etc.). The changes may/will affect the ratio. Usually rate increases should be made by reducing the recovery time (on the hands) and leaving the drive time the same. In training the crew must know the commands for rate and ratio as well as power changes. "Next stroke" - then begin the word "Easy" at the next catch. “Next stroke” “ease your kit” either numbered oars or all crew. “Ship your oars” again either numbered oars or all. "Hold" “Hold Water” is to stop the boat immediately. This command should only be used when you need to stop suddenly. You do not need to warn the crew before using this command. If you have any warning of the need to stop you should use "easy". On the command "hold", the whole crew should stop rowing and place their blades in the water feathered. They will then square their blades in the water causing a rapid deceleration of the boat. "Hold her hard" conveys an even greater sense of urgency. Remember that these are emergency commands and should not be used unless absolutely necessary. Initially you will find coaching pretty hard. Don't worry - it does get easier with practice. The only way to learn is to listen to what the coach says and to try and identify the effect(s) of an error, how to name it, how it is caused and how to correct it. Then, when you think you understand the coaching point, you should coach it yourself when you next observe the error. Try to find different ways of conveying the same message. The rower might respond better to a new way of thinking about the same thing. Concentrate on one error at a time but do not let basics slip while you are working on any new specific area. The three areas of mistakes you will be able to identify early on are - timing, blade depth during drive and handle height during recovery. Timing refers to the ability of the crew to get their blades in and out together. If somebody’s blade is not in the water when others’ are tell them specifically – “3 you are late at the catch”, or, “4 you are coming out early”. With more experience you will be able to identify why exactly this is the case, e.g. body, arms or hands or feet wrong. not feathering too early at the finish. Finally handle heights on the recovery are very crucial for the balance of the boat on the recovery. The hands should go level and the blades should be close to the water without touching it. If somebody keeps their hands too low the blade will go in up the air ‘skying’ or if the blade is catching the water on the way forward the hand heights are too high. If you see somebody erring in this tell them “bow you are skying”. In larger seas the blades need to rise higher during the recovery. These are three categories of flaws you can see from the cox’s seat and you can work towards fixing and in themselves are major basics which must be corrected before moving to more advanced techniques. If more than one rower is suffering from a particular fault it is often worth making the point to the whole crew. They will then all focus on the same part of the stroke and will keep them focused when you make points to other rowers individually. As you get better you will identify many faults at once. However, it will be impossible for a rower to correct them all simultaneously so you should choose one or two to focus on. If the coach is working on one part of the stroke you should not try to correct a completely different error at the same time because it will lead to confusion. If you have an outing without a coach then you must concentrate more on trying to coach the crew yourself. Clearly you can only work on technical points which you can feel or see clearly. In the absence of a coach it is important that you assert your authority - you must not let the crew act like a committee! If you feel it is beneficial, stop and have a crew discussion and then row on. Do not allow talking during rowing! If there is a contentious issue stop and try to talk it out while afloat before the end of the session. The final rowing period will help to diffuse tension before landing. When coaching and fixing problems make sure you always give feedback to your rowers. You should ideally always follow the cycle where you give a technical focus or call for a change, wait for a few strokes, give feedback and either urge for more improvement or encourage the good change. For example “this feels much better”, “good balance”, ”hold the change”, “good but more work needed”, “let’s keep working on it.” As this example shows your remedy to the problem may not be the right one or the crew have not understood you so make sure you keep trying to fix the problem and when improvement comes let the crew know! If you have been wrong say so. 1. You should be succinct. Use only as many words as are necessary to be clear. 2. Do not bombard the crew with information. Say only what you need to say. 3. Make sure your speech is clear and audible. 4. You are giving instructions not requests - speak with authority. 5. Vary your tone of voice to keep the rowers concentrating. Monotone is dull. 6. Speak in time with the stroke. It reinforces the rhythm. 7. Always remain positive and enthusiastic. 8. Do not be afraid of silence. Allow the crew time to think about your instructions. Get the crew used to you so that they expect some silences. If you talk all the time the crew will end up regarding you as background noise and their concentration will wander, OR, they will not take any responsibility and wait for you to chase them all the time. There is very little to be said in this article about motivation. You will learn how to get the best out of your crew over the course of your outings. What works for one crew will not necessarily work for another. You must be encouraging but also critical. If you feel someone is not putting in as much power as you have instructed then you must tell them. Sometimes the crew will be trying as hard as they can but are being ineffective because they are too tense. If this is the case then being aggressive makes matters worse. Sometimes it is more important to calm a crew down and relax them rather than try to get them to work harder. It is important that you are motivated yourself. The crew will not respond to your demands unless you are also dedicated. You do not need to scream but practice projecting your voice so that bow rowers hear you without driving the stroke insane. An enthusiastic, commanding, confident call should be all the motivation needed. A quiet dull voice will result in a quiet dull crew. A crew may be motivated by being informed about the race opportunities ahead of them. Do not let crew look around. They should not be concerned about what is around them unless it is a boat coming up behind which they must not let pass! 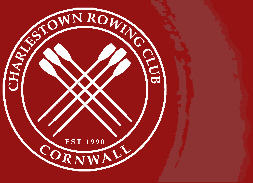 Copyright © 2019 Charlestown Rowing Club! All rights reserved. Designed by 2coves Technology Ltd.